At Dashbot, having processed nearly 60 billion messages, we have seen a wide variety of usecases for conversational interfaces – everything from customer service, retail, banking, travel, games, news, religion, dating, and much more. As the year comes to a close, we wanted to share the insights of industry leaders in the space. We surveyed experts in conversational interfaces to see what they thought were the biggest trends of 2018 as well as their predictions for 2019. Three common themes emerged from our group of experts in regards to the biggest trends of 2018 – the rise of voice interfaces, enterprises investing more in conversational interfaces, and the use of conversational interfaces within e-commerce usecases. The interest in voice interfaces really took off in 2018. We saw this at CES at the beginning of the year with all the Google Assistant activations and the proliferation of devices incorporating Alexa and Google Assistant – mirrors, cars, microwaves, and more. Advancements in voice assistants was one of the most common trends in 2018 cited by our panel of experts. As pointed out by Pat Higbie of XAPPMedia, a duopoly emerged between Alexa and Google Assistant. Both platforms continue to push each other and expand both in features and reach – expanding geographically through supporting more languages and expanding more broadly through multi-modal and additional device support. As Max Child of Volley adds, the platforms are starting to become “real” through monetization and retention tools. Consumer adoption of these two platforms has led to enterprises needing to support both as part of an overall voice strategy. As Connor Cirillo of Hubspot mentions, personal assistant devices are becoming the “center of gravity” for consumers – becoming entrenched in consumers lives. We saw this in our survey of consumers as well – 65% responded the device has had an impact on their behaviors and daily routines. As Brandon Kaplan of Skilled Creative points out, we’re still in the early days of voice and haven’t yet reached the potential of what the platforms can do. However, the devices are having an impact on the next generation of consumers – ones that will expect to be able to speak to assistants for their needs. Our panel of experts saw e-commerce as another area with a lot of growth over the past year. Enterprises have embraced conversational interfaces for the full e-commerce lifecycle – pre sales to post. As Ben Parr of Octane mentions, merchants are using chatbots for everything from customer acquisition, to retargeting, and post sales customer service. As Ryan Maynard of ChatDynamo points out, chatbots are helping drive revenues for businesses and becoming part of the overall e-commerce strategy. Following up to shopping cart abandonment and re-engagement are key opportunities for chatbots. According to Ryan, re-engagement through a Facebook Messenger bot is more effective than email or ad retargeting. Ben adds, shopify stores have seen 3 to 25% increases in revenue by adding a chatbot. While conversational interfaces are still relatively new, 2018 saw enterprises investing more seriously in them. As Sergio Passos of Blip notes, brands are moving more from Proof of Concepts to ROI based projects. Enterprises are also expanding their application of chatbots for more use-cases. As Christian Brucculeri of Snaps points out, enterprises are expanding from single use cases to end-to-end experiences to cover more of the customer journey – from awareness and engagement, to post purchase customer care. Mehfuz Hossain of SmartLoop adds that enterprises are understanding the value of these interfaces and expanding the use from marketing to customer service. Not only are enterprises expanding their conversational use cases, they’re investing significantly in in-house teams as Alex Weidauer of Rasa points out. We see this in our own customer interactions – more and more brands are building out conversation specific teams. In addition to e-commerce and voice related use-cases, our panel of experts are seeing quite a bit of interest in Banking and Finance as both Scott Ganz of Intuit and Alex mention. Three themes emerged from our experts predictions: growth in voice assistants, improvements in AI, and better conversational apps. Just as the rise in voice was one of the biggest trends of 2018, the growth in this space is one of the most cited predictions. As voice assistants, and smart speakers, continue to take off, better use cases, more functionality, and new challenges will emerge. Our panel of experts see growth in multi-modal experiences, along with new use cases for these types of devices. Scott Ganz predicts designers and developers will take multi-modal much more serious, and while it may not quite reach mainstream, it’s on its way. Will Hart of Rain, sees the multi-modal functionality opening the door to new ad units. Another voice trend our experts see is the Google Assistant gaining traction. Audrey Wu of Convrg predicts Google will even gain traction on iOS as it’s a better experience than Apple’s Siri. David Witting of Rocket Insights believes Google will close the gap with Amazon as well. As Alexa and Google Assistant add more features and functionality, new types of challenges may emerge. Lucas Ives of PullString ponders whether Alexa will be more of a “concierge” or an “oracle” and what impact will that have on brands. Pat of XAPPMedia believes the implicit innovocation of Google Actions and the nameless innovocation of Alexa Skills is essential for discovery, but will lead to increased competition to be number one in a particular category. Given the space is relatively new, many enterprises have not yet fully taken advantage of the conversational nature when building applications. Much like in the early days of iOS when the initial apps tended to be relatively basic and not quite useful – e.g. the “fart apps” – many of the initial chatbots and voice skills were in a similar vein. Our experts see this changing – enterprises developing better user experiences that leverage the conversational nature of the interfaces. Not only will brands develop better experiences, they will expand the use-cases into more places. Our experts see brands moving out of Proof of Concepts to focus on usecases they can do really well. One common usecase that stands out in the predictions relates to customer service. In fact, Nico Acosta of Twilio predicts conversational IVRs will become the norm in the future. Related to the above predictions, our experts see improvements in AI, tools, platforms, and interoperability in the near future. The underlying AI will get better in the future. One thing our experts point out is that not all chatbots are AI based. That being said, we see continual improvements in Natural Language processing and AI that can help improve the user experiences in the future. One theme is the increased opening of platforms – for example Facebook opening WhatsApp similarly to Messenger. As more platforms open up and existing platforms add more functionality, having standards can be helpful. Andy Webb of the BBC predicts the underlying platforms will continue to build common interaction models. 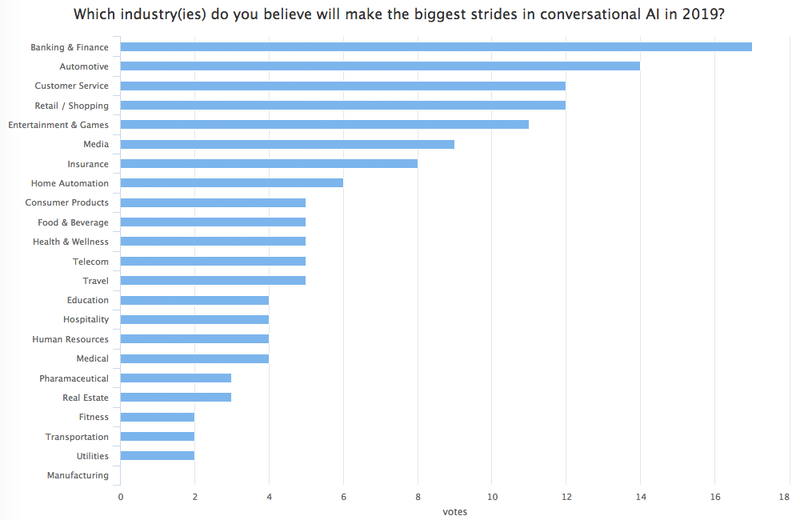 We asked the experts which industries they think will make the biggest advancements in conversational interfaces in 2019. The most common choices were Banking / Finance, Automotive, Customer Service, and Retail / Shopping. Some of the biggest advancements over the past year as well as predicted future growth is in voice interfaces. 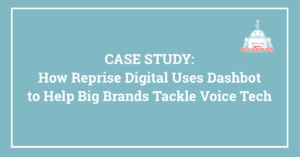 At Dashbot, we are strong believers in voice – it’s the natural way humans communicate. As we have mentioned in previous articles, if you remember the videos of two-year-olds swiping iPhones and iPads, the same thing is happening with devices like Alexa and Google Home – kids know how to interact. As many of our experts have pointed out, and we see first hand in the analytics – customer service, across verticals like banking and automotive, and retail commerce are some of the biggest usecases in this space. It makes sense as well – enterprises want to provide customer service 24/7 but do not necessarily want to pay for human agents – they need chatbots to be effective to understand users requests and respond appropriately. In terms of commerce, retailers and food delivery brands are trying to enable users to make purchases through conversational interfaces. We believe conversational interfaces are the natural evolution of human computer interaction. Chatbots and voice apps are maturing as more brands move the initiatives out of innovation and into the business units. There is a lot of opportunity in this space and we look forward to seeing what both brands and developers build in the future. Desire for companies to find multi-platform conversational solutions for their existing content. Companies will continue to struggle to get past the “app” model, although more and more will find that conversations present a different way to address their users’ needs. Platforms will continue to mature to offer more and better features that address these needs. A move to standardisation of user interactions through the use of API’s, building common ingest frameworks for content and leaving the interaction design with the platform. 2 main predictions. One is a continuation of the move of platforms to build a common interaction model for publishers, the 2nd is to start to see greater AI-AI interoperability and eco-systems evolve. The rise of voice and all the biggest tech players in the world trying to find a place in this ecosystem. Branded experiences will continue to rise, especially in ecommerce use cases. Alexa and Google Home will continue to dominate the smart speaker space. Google assistant will start gaining traction for iOs users because frankly, it’s a better voice AI product than Siri. Customer call center voice to text analytics. Numerous startups are using Google and Amazon APIs to build new services for call centers such as emotional, linguistic, and prosodic analysis on calls. Customer service agents and sales reps are now armed with far more information about their effectiveness than ever before. The rise of branded voices. More companies will invest money into creating voices that match their brand’s aspirations and customer targets. The biggest trend of 2018 was the rise of bots for ecommerce — no question. Thousands of merchants and ecommerce businesses adopted chatbots for automated customer support, retargeting, and customer acquisition. Shopify stores in particular saw 3 to 25 percent increases in revenue simply by adding a chatbot to their marketing arsenal. Chatbots will become much more intelligent in 2019. For the last few years, we have seen simple chatbots that can do many of the things bots do with email. In 2019 however, we will see chatbots that start to really push the boundaries of what AI can do. Multi-Modal and Voice SEO were the most key feature trends we saw in terms of “inside baseball” industry trends for developers and marketers. In terms of entire platform trends, the biggest trend is still simply distribution. Growth in market size and market share by Amazon and Google in the conversation space dominated headlines, and the features that both platforms were releasing in waves to try to garner attention by consumers and developers. We’re in an awkward adolescence right now, where we’ve had a growth spurt in distribution, but haven’t reached our potential in terms of what the platform can do. 2019 is the time more that functional growth. In 2008/2009, the first few years of the iPhone, the most popular apps were a lightsaber app and a fart app. it wasn’t until developer tools and functional capabilities matured that we realized the potential of apps, and we finally created venmo, vine, instagram, etc. We are still in lightsaber app mode right now, with fairly simple conversational apps, being deployed by internal teams or creative technologists who are getting their sea legs with the platforms. In 2019 we see much more matured experiences being launched, leveraging more advanced data integrations, machine learning, better multimodal visual assets, higher production value, and true business tools such as contact permissions and VOICE SEO. We also predict that brands will begin to allocate very real marketing budgets behind their conversational app launches, resulting in better discovery, and more stickiness in terms of retention. 2019 is the make or break year for conversational stickiness across the consumer platforms. Our recommendation is for everyone to bring their best, because it’s going to be a space race. High-production media related skills, like the Dunkirk Alexa Skill or Sesame Street’s Esme and Roy. 1) Smart speakers will be used much more for shopping at home, and we will see the first big brands bring voice into the physical store. 2) Voice & visual activations on smart speakers will become the new standard. 3) Brands will make progress in figuring out who within their organizations will own Voice, and as a result we will likely see a saturation of branded skills and actions by the end of the 2019 year. This means the ‘first mover advantage’ window will close in the first half of the year. 4) Media companies will continue to dominate in terms of skill engagement, and we may see interesting partnerships between brand and media companies. 5) Voice will become a mainstream part of life as it continues to infiltrate homes, cars, hotels, and other public spaces. The dominant voice assistant trend in 2018 was the language localization that brought exposure to more countries. This included both smart speaker and smartphone expansion. A secondary trend was added feature depth on the leading platforms as they raced for feature parity and looked for ways to get an edge on competitors. In 2019, the voice assistant competitive focus will shift from language support to extension to new devices. This will include both surface expansion and identifying new use cases based on device-specific contexts. Personal assistants like Amazon Alexa and Google Home continued to become the “center of gravity” for consumers. These companies released more tools to entrench themselves in consumers lives, earlier on. Interactive storytelling may seem small today, but it’s having a huge impact on the next generation of consumers. People growing up today expect to speak their wants into the world and assistants make it happen. That’s a fundamental shift in how interactions (and business) will happen in the future. Facebook speeds up the monetization efforts of Messenger, WhatsApp, and even Instagram messaging. On stage at F8 in April 2019, Mark Zuckerberg announces open WhatsApp APIs (a la Messenger in 2016). More tools come out that help businesses tie the core Facebook product to messaging platforms. It also causes another wave of “chatbot hype” that suggests the adoption curve is further along than it might be. We saw our customers expand their objectives with automation from single use cases into end-to-end experiences. Increasingly, we see enterprises that started with a single use case (e.g. shopping, service deflection) grow their ambitions to cover more of the customer journey, from awareness and engagement to post-purchase care and business process automation. I expect we’ll see this trend continue as more businesses realize that they can create impact across the customer journey. Enterprise brands are going to expand both the ‘what’ and the ‘where’ as it relates to automation. If 2018 was about expanding use cases, we believe 2019 will be about expanding touch points as well, offering automated conversations in more places in their digital ecosystems. Further platform penetration & device expansion. Google is going to start closing the gap with Amazon. Experience investment will dip as early adopters realize that discoverability & repeat usage are low across the board. 2018 had some memorable moments of backlash against our still severely over-hyped space, but the entry of nearly every CSP platform that provides any type of live chat or messaging service, or wants to, into the chatbot space, and the uptick in M&A and funding activity, as well as steadily increasing enterprise case studies and demand, and the beta opening of new channels like WhatsApp and Apple Business Chat, were all strong signals of a healthy market. Bots are here to stay. I predict a SPAMpocalypse in the form of “Messenger Marketing.” “Business Messaging” may be a big business; email marketing is big. But personally I’m not interested in recreating email marketing, or email anything, or websites or apps in chat form, to spam people with wrong message, wrong time, wrong everything. In 2019 Pandorabots will continue to work on computers that can actually hold a conversation, and until we have a major AI breakthrough in natural language understanding and generation, I doubt there will be “paradigm” shifts to speak of in terms of talking or texting usefully with technology. Fortune 500 companies allocating real budget for exploration of the voice computing space. The number of voice computing endpoints will continue to skyrocket, and it will become more obvious which direction the big companies are heading: i.e. is Alexa going to be a concierge or an oracle? One version of that world has a lot of potentially complicated implications for brands. Enterprise started to understand the value of conversation AI in automating their mundane tasks. It is not tied to one channel but overall the need to automate marketing and customer service. Automation through voice and chatbots. A duopoly crystalized between Amazon Alexa and Google Assistant to the point where consumers are using both assistants at scale and brands need to address both assistants in their voice ai strategies. Voice search in the form of implicit invocation of Google Assistant actions and nameless invocation of Alexa skills will become essential to the discovery of third party voice apps and a race will be on in every product category for position 1 in search across both platforms. Bots driving revenue for businesses. 2018 forced brands to take a closer look at their chatbot strategies and start associating clear monetary value to chatbot engagement. For e-commerce businesses this meant using the chatbot to drive sales. Shopping cart abandonment/re-engagement emerged as a clear reason why e-com businesses need chatbots and why Messenger cart abandonment follow up is more effective than email or display ad retargeting. For some non e-commerce brands this meant exploring new ways to monetize their chatbot engagement. Some brands started experimenting with paid chatbot referrals, lead generation, and other in-bot ad experiences. By the end of 2019, Facebook Messenger will no longer be the favorite platform for chatbot developers. As Facebook looks to restrict messaging and monetize “sponsored messages”- SMS will emerge as the new preferred medium. New platforms and tools will emerge to make it as easy to deploy cool SMS chatbot experiences in 2019 as it is to deploy cool Messenger experiences today. Banking and personal finance assistants really proliferated this year, and they’re a great use case for the medium. I think multi-modal interaction is coming, and while it may not reach the mainstream market in 2019, designers and developers are going to really start taking it seriously and working towards that goal. Reading and speech are the two easiest and fastest ways to converse, so they’re going to start working together sooner or later. Brands are moving from PoC to ROI-based projects. Brands will realize that chatbot is not equal to AI, but a set of tools and process needed to build, run and evolve their contacts in conversational apps. In 2018, many companies have tried to build a different type of experiences along the lines of gift finding, entertainment bots. On the other hand, we have noticed that the simple use cases that we all know work best, such as schedule appointments or order a beer. I do believe banking and insurance will become a huge trend in 2019. The reason is use case and repeatability. As messaging becomes more and more popular, we strongly believe consumers will adopt automated experience with a use case they already know such as: check balance, bill payment or insurance claims. 2018 was definitely the year of multi-modal. Multi-modal will be an ever-more important element of Voice; this should lay the groundwork for ad units within first-party voice queries. B2B applications of Voice will start to mature; the potential operational efficiencies of this integration could have staggering implications.